Bharti Airtel has now revised the Rs 1,199 postpaid plan, taking on Vodafone‘s Rs 1,299 RED postpaid plan. Airtel has increased the data benefit by 30GB on the Rs 1,199 postpaid plan, taking the total amount of data to 120GB from the earlier 90GB. 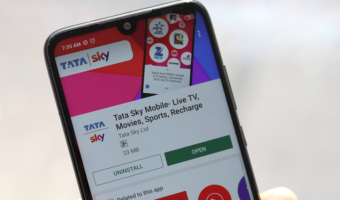 Alongside the Rs 1,199 postpaid plan revision, the telco also added extra 40GB data to the Rs 799 postpaid plan, which takes the total amount of data to 100GB per month. Both these postpaid plans fall under the company’s myPlan Infinity postpaid plans, and they even come with data rollover facility, with which a user can store up to 500GB in their postpaid account. Earlier, Airtel revised the Rs 499 and Rs 649 postpaid plans by changing the data benefit to 75GB and 90GB respectively. Also, these plans feature free add-on connections, which is the biggest highlight of Airtel postpaid plans. While Vodafone India is not offering any RED postpaid plans between Rs 499 and Rs 1,299, Airtel is providing three plans within the same range. After the revision, Airtel’s Rs 1,199 postpaid plan provides better data benefit than the Vodafone’s RED Rs 1,299 plan. 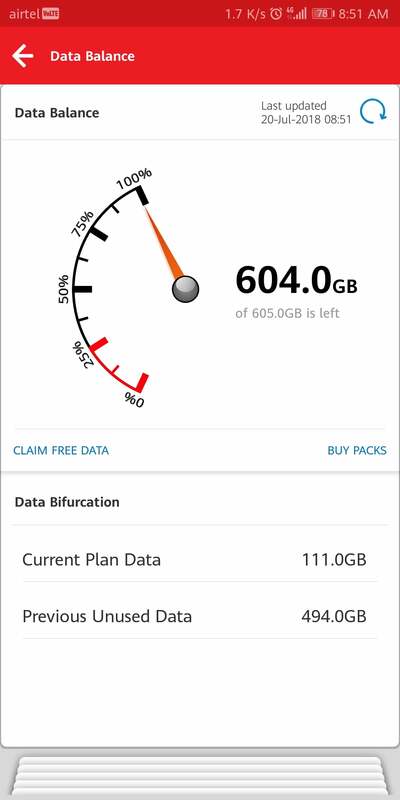 Vodafone is providing 100GB data with the plan, but Airtel is giving 120GB data at a slightly lesser price. Both the Airtel myPlan Infinity Postpaid plans of Rs 799 and Rs 1,199 also offers unlimited voice calls without any FUP limit, 100 SMS per day, free Amazon Prime subscription for one year and the data benefit comes with a carry forward option too. But the best part with Airtel postpaid plans is the free add-on connections. 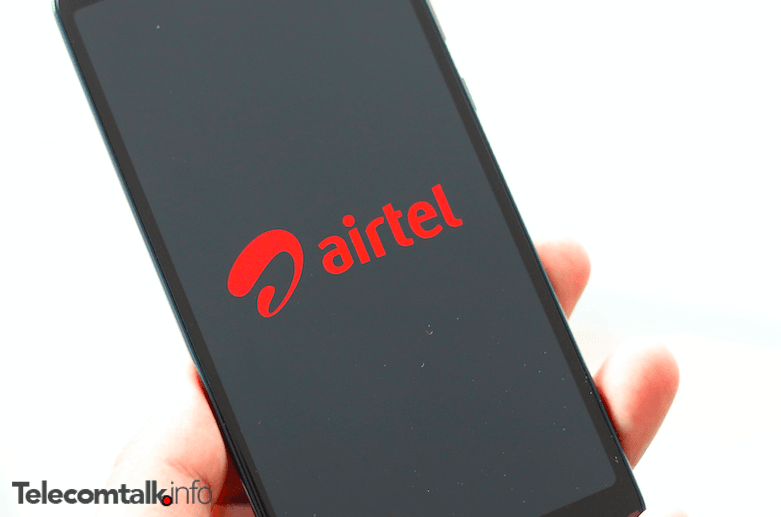 Airtel is offering two add-on connections with the Rs 799 plan and three free add-on connections with the Rs 1,199 postpaid plan. 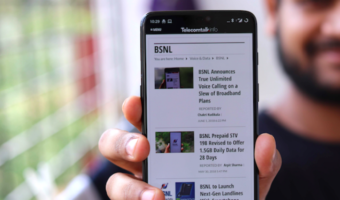 This essentially means that the Rs 799 bill is valid for three postpaid numbers including the primary number, while the Rs 1,199 bill is for four postpaid numbers including the parent number. 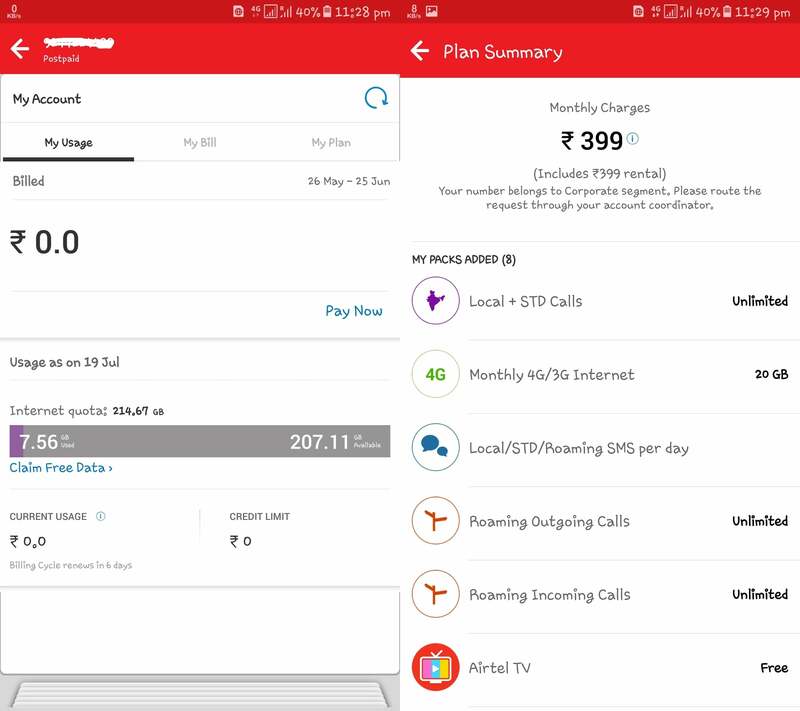 The Rs 649 plan offers one free add-on connection, meaning the rental value of Rs 649 is for two Airtel postpaid numbers. This is the best part of choosing Airtel’s postpaid service ahead of Vodafone and Jio’s. Vodafone also offers a RED Together scheme, but it requires an additional price for adding a single connection to the primary account. 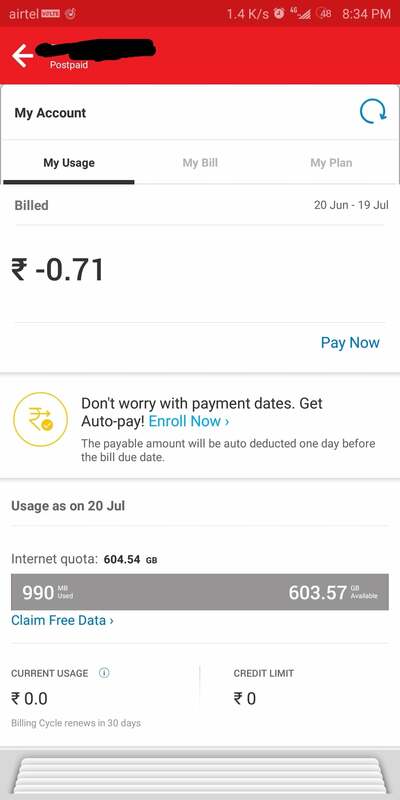 Airtel’s add-on connection doesn’t need any other charges. The new plans will be effective on your postpaid plan from next billing cycle. Nope. It is upto 500GB. 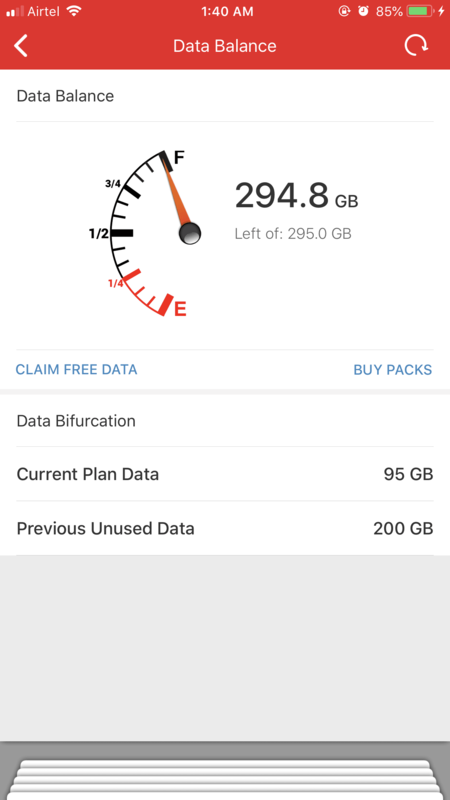 I am using Infinity 399 plan and now my this month data limit is 207.11GB (All thanks to earlier SURPRISE offers and data roll-overs). Please see the attached screenshot. Ya its Honor View 10 . 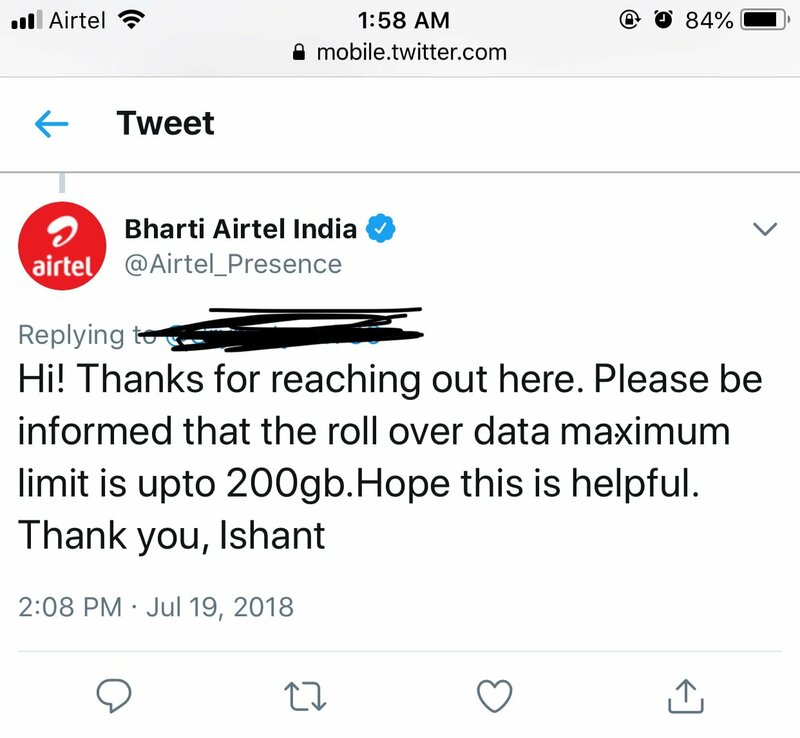 You don’t use data on Airtel much? No its postpaid plan .For proof see above ‘My account’ in attached image . I don’t understand their policy,i have 5 numbers and in all of them only 200gb is being carried forward. You are Nadeem, thats the current offering. Rollover – 200GB. Airtel is being selective again with data roll over. What’s the use of these plans when their is not supposed to use what they offer? P.S. I am not fanboy.